This Nativity was handmade by Carolina Tamayo in Bogata, Colombia. Carolina performs the first bisque firing of the ceramic pieces using her own kiln. Then she adds a clay slip that contains metal oxides to create the unique textures before she fires the figures a second time. This technique is called engobe. The set includes Joseph, Mary, baby Jesus, two oxen, and an arch. 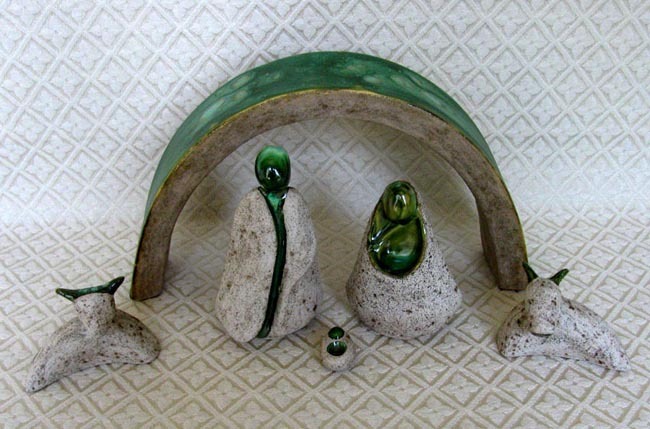 The arch measures 5.5 inches tall by 9.75 inches wide. Joseph stands 4.5 inches tall. We photographed this set with baby Jesus on the ground, but He actually fits in Mary's arms near her face. Carolina studied fashion design, but she always liked ceramic work so she pursued an opportunity to learn how to work with clay. She initially created home decor pieces. In 2009 she made her first Nativity set. Recently she has created other Nativity styles.